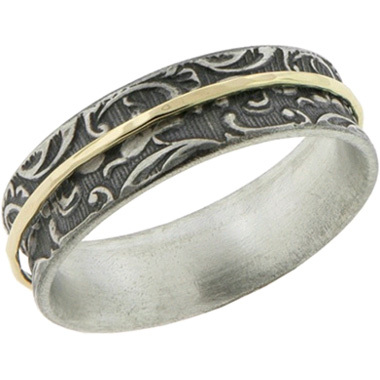 On this unique paisley design of stamped sterling silver rotates a spinning band of solid 14k yellow gold giving this organic design a alluring chic. Made from recycled precious metal that is lead and nickel free. David Tishbi Jewelry comes with a Lifetime Warranty. Apples of Gold is an Authorized David Tishbi Retailer. We guarantee our Paisley Sterling Silver and 14K Yellow Gold Spinner Ring to be high quality, authentic jewelry, as described above.